The age of the Candidates upper age limit should be Official Notification.. Age relaxation is applicable 5 years for SC/ ST, 3 years for OBC, 10 years for PwD (Gen), 13 years for PwD (OBC), 15 years for PwD (SC/ ST) candidates as per rules. Interested and Eligible can apply online through Official website www.gailonline.com on or before 15-09-2017. Last Date for Submission of Application: 15-09-2017. The age of the Candidates upper age limit should be 30 years as on 22-09-2015. Age relaxation is applicable 5 years for SC/ ST, 3 years for OBC, 10 years for PwD (Gen), 13 years for PwD (OBC), 15 years for PwD (SC/ ST) candidates as per rules. Candidates should have Degree in this Recruitment process they must have passed Bachelor Degree in Engineering in Chemical/ Petrochemical/ Chemical Technology/ Mechanical/ Production/ Electrical/ Electrical & Electronics/ Instrumentation/ Instrumentation & Control/ Computer Science/ Metallurgy with relevant experience. Candidates should have to pay Rs. 200/- by Demand Draft in favour of GAIL (India) Limited payable at New Delhi. No fee for SC/ ST/ PwD candidates. Interested and Eligible can apply online through Official website www.gailonline.com on or before22-September-2015 and Take a print out of the filled in application forms and attach photo copies of all necessary certificates with passport size colour photograph on it along with DD, envelope should be super scribed on the top as "Application for the post of --" sent by Ordinary Post to Sr Manager (HRD), GAIL (India) Limited, GAIL Bhawan, 16, Bhikaiji Cama Place, R K Puram, New Delhi, PIN-110066 on or before 05-October-2015. Last Date to Apply Online: 22-September-2015 by 1800 hrs. Last Date for Submission of Application: 05-October-2015. The age of the Candidates upper age limit should be between 30 years to 40 years as on 22-09-2015. Age relaxation will be applicable as per Govt of India rules. Candidates should have to pay Rs. 50/- (General & OBC) by Demand Draftdrawn in favour of GAIL (India) Limited payable at New Delhi. No fee for SC/ ST/ PwD candidates. Interested and Eligible candidates an apply online through Official website www.gailonline.com on or before22-September-2015 and Take a print out of the filled in application forms and attach photo copies of all necessary certificates with passport size colour photograph on it along with DD, envelope should be super scribed on the top as "Application for the post of --" sent by Ordinary Post to Sr Manager (HRD), GAIL (India) Limited, GAIL Bhawan, 16, Bhikaiji Cama Place, R K Puram, New Delhi, PIN-110066 on or before 05-10-2015. Last Date for Submission of Application: 05--October-2015. The age of the Candidates upper age limit should be between 40 years to 50 years as on 17-09-2015. Age relaxation will be applicable as per Govt of India rules. Candidates should have Degree in this Recruitment process they must have passed Bachelor Degree in Engineering with relevant experience. For other information refer notification. Candidates will be Selected on the basis of Group Discussions and interview. Interested and Eligible candidates an apply online through Official website www.gailonline.com on or before17-September-2015 and Take a print out of the filled in application forms and attach photo copies of all necessary certificates with passport size colour photograph on it along with DD, envelope should be super scribed on the top as "Application for the post of --" sent by Ordinary Post to Sr Manager (HRD), GAIL (India) Limited, GAIL Bhawan, 16, Bhikaiji Cama Place, R K Puram, New Delhi, PIN-110066 on or before 26-09-2015. Last Date to Apply Online: 17-September-2015 by 1800 hrs. Last Date for Submission of Application: 26-September-2015. The age of the Candidates upper age limit should be 28 years as on 29-01-2016. Age relaxation is applicable 5 years for SC/ ST, 3 years for OBC, 10 years for PwD (Gen), 13 years for PwD (OBC), 15 years for PwD (SC/ ST) candidates as per rules. Candidates should have Degree in this Recruitment process they must have passed Full-time Bachelor Degree in Engineering in Chemical/ Petrochemical/ Mechanical/ Production/ Electrical/ Electrical & Electronics/ Instrumentation/ Instrumentation & Control/ Computer Science/ Electronics/ Electronics & Communication with minimum 65 % marks. Candidates will be Selected on the basis on GATE-2016 Scores, Group Discussions and/ or interview. 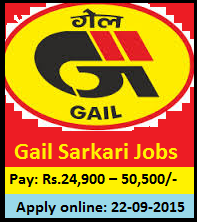 Interested and Eligible candidates have to first apply for GATE-2016 and thereafter, appear in GATE-2016 & for GAIL apply online through the website www.gailonline.com from 22-12-2015 at 1100 hrs to 29-01-2016 by 1800 hrs. 0 Response to "GAIL Job S-5 and S-3 Grades Recruitment 2017-2018 at www.gailonline.com"